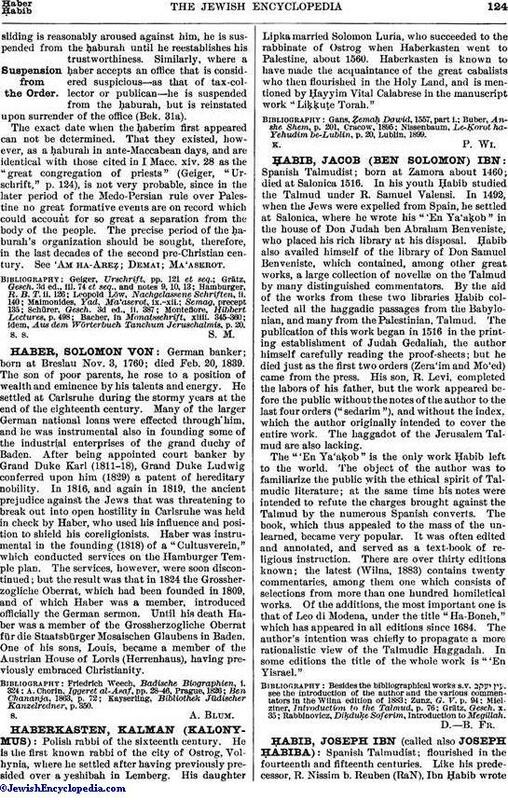 Spanish Talmudist; flourished in the fourteenth and fifteenth centuries. Like his predecessor, R. Nissim b. Reuben (RaN), Ibn Ḥabib wrotea commentary on the halakot of Isaac Alfasi, entitled "Nimmuḳe Yosef," published with the text and the commentary of R. Nissim (Constantinople, 1509). Against the opinion of Conforte ("Ḳore ha-Dorot," p. 26a) that Ibn Ḥabib commentated only those treatises which R. Nissim had omitted, Azulai ("Shem ha-Gedolim") proved that Ibn Ḥabib's "Nimmuḳe Yosef" covered the entire halakot of Isaac Alfasi, but a part of it had remained unpublished, and that the commentary to the halakot of Mo'ed Ḳaṭan and Makkot, attributed to R. Nissim, belongs to Ibn Ḥabib. The latter quotes Asher b. Jehiel, Yom-Ṭob ben Abraham, his master RaM, and R. Nissim himself. The "Nimmuḳe Yosef" on Ketubot and Nedarim was also included in the work "Ishshe Adonai" (Leghorn, 1795), and the portion on Shebu'ot in the "Bet ha-Beḥirah" (ib. 1795). 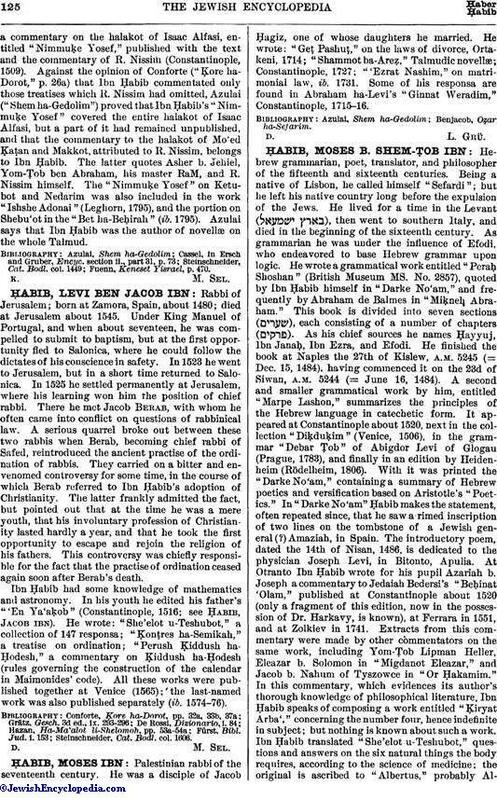 Azulai says that Ibn Ḥabib was the author of novellæ on the whole Talmud. Fuenn, Keneset Yisrael, p. 470.